If you’re a professional user then it is common to you too and may also face several issues in day by day execution. PST corruption and damage is a hackneyed issue for professionals. But it seems tremendous when you required the data quickly and as soon as possible. Then what will you think of and what will you do to repair your Outlook PST file which is consists of significant data such as emails, attachments, contacts, calendar entries, tasks, journals, etc.? Probably, you utilize the free-of-cost Inbox Repair tool or (scanpst.exe) available from Microsoft as a utility tool? With the intention to repair Outlook PST file, you may download the (scanpst.exe) tool. However, it might not fulfill your need and the utility tool prompts up with “Fatal Error: 80040900”. But, its hackneyed problem that you get “Fatal Error: 80040900” while utilizing scanpst.exe to repair your PST File. Then you re-try, but you have to see the error again and again while repairing the damaged Outlook PST file. Every step you are taking to repair your depraved and damaged PST file, you will be getting the equivalent error alert repeatedly. 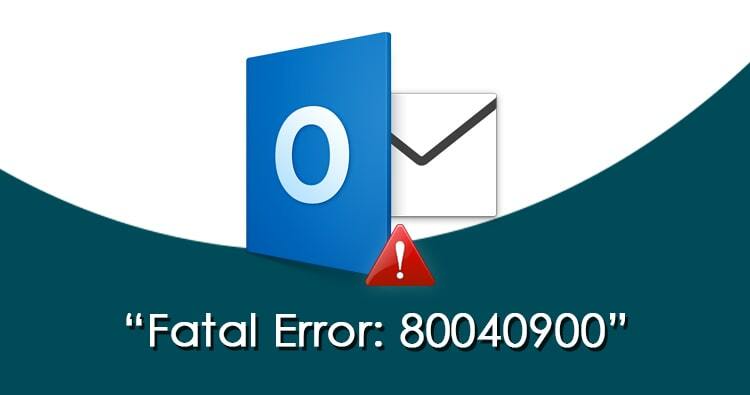 In such a situation, all that you should or can do is to fix “Fatal Error: 80040900” in Microsoft Outlook. Well, might you have a question about the error such as why the error occurs while utilizing Inbox Repair Tool to repair Outlook PST file? The limitations of the tool can be a fact of occurrence error “Fatal Error: 80040900”. The scanpst.exe utility tool cannot accomplish the repairing if the level of damage is too high. Whenever you get stuck in the tremendous situation of error messages while utilizing the Inbox repair tool, it will best to settle the error messages instead of repairing and rescuing the Outlook PST file. To fix the error issues, you should use technical software that execute automatically, easily and safely. There is no way to execute and fix the error issue “Fatal Error: 80040900” except technical software, so read the entire post to settle the issue with the proficient way. The reason behind the recommendation of Shoviv PST Repair tool is it’s greatly proficient in the execution. It mere not redouble the capability of (scanpst.exe) utility. It redoubles the utility tool limitation such as it exceeds repairing of large PST files (2 GB size or more) or tremendously damaged PSTs, etc. This software is fully featured software loaded with features and benefits. Shoviv PST Repair tool not only repairs PST files, it is originated with two more features such as splitting and compacting PST file. You can split and compact file while saving the repaired file. These features facilitate to reduce the chances of corruption in PST file. The software is capable to split Outlook PST file by the quantum, Date range, and Email Id. The software is also capable to compact Outlook PST file with its prominent feature. So, you can try three ways to compact your PST file. You can compress the entire Attachments consist with emails in a new or in an empty PST file. You can also extract emails attribute and can save attribute of emails to a folder, wherein there is no lack of interlinking. It will prove auxiliary in removing entire email and attribute in a newly created PST file. Note: Outlook users might also be interested in PST to Office 365 Migration.